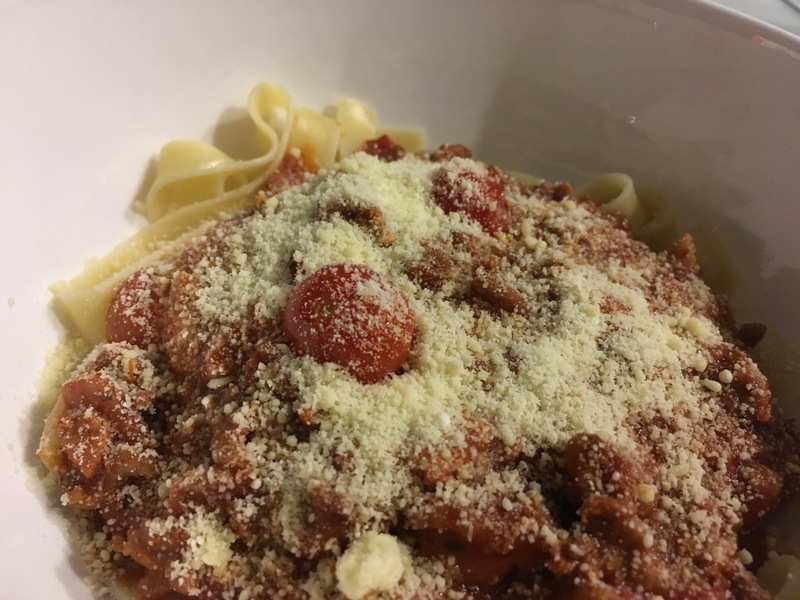 This post follows on from The Making of Spaghetti – Part 1 and The Making of Spaghetti – Part 2 and is my own recipe for a rich, tangy, spaghetti sauce. Unfortunately, I have not tested the written word against the physical process, but I’m at least 99% sure, this is true and correct and remember, this is not authentic Italian bolognese. I suggest prepping everything first – ‘slice and dice and weigh and measure all the ingredients before you begin’ – including opening the tinned tomatoes. This will allow you to work quickly and add everything in turn without getting flustered (for want of a better word). step 1: Using a large pan8, cook the diced bacon until well done (but not crispy) and set aside on absorbent paper towel to drain the excess fat. step 2: To the same pan, add the diced onion and capsicums. Spray with oil first, if needed, and add salt and pepper to taste9. Cook until the onion becomes translucent and remove from the pan and set aside. step 4: Once the mince has browned, reduce the heat (a little) and add the mixed herbs, chilli, garlic and ginger if you are using it. Stir constantly and appreciate the amazing aromas that are starting to develop. step 5: Add the bacon and sautéed vegetables to the pan and continue stirring, incorporating everything together. step 6: Now add the tomatoes and stir through. If using the additional sauces, add them now. I use a generous squirt of each (because I have them in soft, squeezable bottles) and I’m guessing the amount would be approx. ¼ cup of each. For a fuller, richer flavour, I also add the tomato paste but this is an optional extra and can be omitted. I often find I don’t have any in the house. step 7: Bring to the boil, then reduce the heat to a gentle simmer. step 8: Lid the pan, and allow to simmer for at least 1 hour, stirring frequently, but not constantly. The longer the sauce simmers, the deeper the flavours will become. Generally, 1½ hours will do, but you do need to stir frequently and continue simmering until the tomato juices have been reduced and the sauce thickens. It should not be runny and won’t taste the same if it is. step 9: Taste the sauce as you go and add additional herbs and spices to enhance the flavour if required10. step 10: Prior to serving the sauce, add the diced mushrooms and cherry tomatoes if using them, and stir through. The aim here is to heat them without cooking them, so I usually add them about five minutes beforehand – usually when I add the pasta to the boiling water. step 11: Serve with al dente pasta, parmesan cheese, and garlic bread and enjoy. Extra sauce can be frozen for use later. I’ve kept the frozen sauce in my freezer for months with no ill effect on its taste. This quantity makes enough for three meals for me and Dean – he does love sauce with pasta, not pasta with sauce – and, generally, we do have a small amount leftover that Dean has with/for lunch the following day. I guess I should clarify the red wine I use. I love Merlot, particularly a good Cabernet Merlot and my all time favourite is from Annie’s Lane. I was thrilled we visited their cellar door when we drove through Clare Valley in South Australia more than three years ago and I can’t believe it has been that long since we were there. Last, but by no means least, if you do try this at home, please come back and leave a comment. I’d love to hear about what you think of my personal recipe for our favourite family staple. 1 I use 95% fat-free Heart Smart Extra Lean Beef Mince. 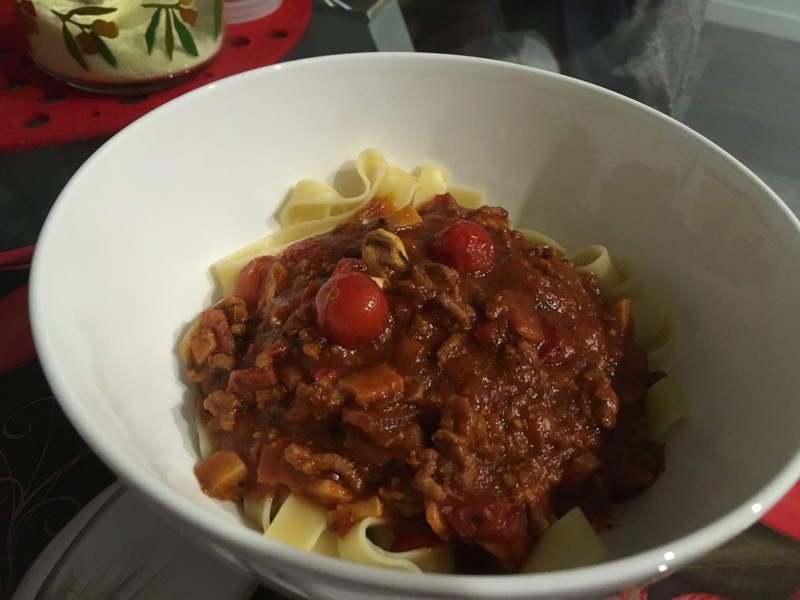 2 I use Masterfoods Freshly Chopped Chilli because I have used it for years and I know exactly how much to use to get the desired amount of heat. Use less if you are unsure or don’t like that bite that chilli adds. I also use Masterfoods Freshly Crushed Garlic and Masterfoods Freshly Grated Ginger for (pretty much) the same reasons. If I have fresh garlic in the house, I mince three or four cloves depending on their size. 3 I use either Masterfoods Italian Herbs or Masterfoods Mixed Herbs (this is starting to sound like an advertisement for Masterfoods). However, I have also mixed my own using dried Parsley, Sage, Rosemary and Thyme (sounds like a good line for a song 🙂 ) as well as Marjoram, Basil and Oregano – I have Basil and Rosemary growing in my garden now and often use them. 4 I use any brand of tinned tomatoes as well as any variety. Gourmet, Roma, vine-ripened – it doesn’t matter, each is equally as good as the other and I don’t even bother using fewer herbs if I buy a variety that has them added. You can also use fresh tomatoes but will need a larger quantity. It’s been a while since I used fresh tomatoes, so I’m only guessing here when I say you might need 1 – 1½ kilos of tomatoes or perhaps even 2 kilos (2.2 – 3.5 pounds or even 4.6 pounds). Start by add 1 kg, then add the rest ½ at a time, if needed. The mince should be swimming in the juice of the tomatoes. This is then evaporated/reduced during the simmering process. 5 I use San Remo Tagliatelle pasta because it comes wound up into little ‘nests’ that are easily added (dropped) into the pot of boiling water. I then use tongs to gently encourage the pasta to unwind. 6 The cherry tomatoes in my photo are small, homegrown, and full of flavour and by adding them I invented, and hence, added a new variety to my Fuel Production – Turbo Charged Deisel. If using them, I recommend sourcing small cherry tomatoes, Solanato, mini Romas, or grape tomatoes. If you think they are too big, cut them in half before adding them to the sauce. 7 For extra punch, I recommend using HP Sauce. Dean loves it, but I’m happy with the common variety BBQ Sauce. 8 I use my favourite pan – a 26″ cast iron pan though I would like a larger one (hint, hint Santa) because this quantity of sauce does fill the pan to the brim. I also have a special wooden spoon I use that has developed a gorgeous, vibrant orange colour over the years. 9 I use pink rock salt and Hoyt’s Four Colour Mix peppercorns and I grind both directly into the pan – approx. 5/6 turns of salt and twice that amount of pepper. 10 I often miss this step as I’ve been making this sauce for so long now that I know how good it will be without tasting it. This is not me bragging, just stating a fact, however, Dean usually sneaks into the kitchen for a spoonful or two when I’m not looking, so I guess he is my taste tester. I’m still working on a printable version of my recipe and will add it to my Recipes page when I’ve had time to finish it. As it is, Dean just said/asked, “Let’s have spaghetti for dinner tonight, that’s an easy meal to make isn’t it?” I guess it will give me the chance to ensure I have included all the ingredients and have written the method correctly.